French physician René Laennec envisioned in 1816 rolled sheets of paper into a tube that amplified sounds. He went on to invent the stethoscope and is considered the father of auscultation. Well, a lot has not happened since then. The stethoscope has become an iconic symbol of the fact a doctor is in the house, or clinic, or hospital, but changes have been modest. While medical findings and devices have grown by leaps and bounds, there have been plenty of murmurs in the medical community that the stethoscope may near extinction. Witness The Washington Post article that appeared in 2016. Still, said that article, experts agreed that stethoscopes had value for listening to lungs and bowels for clues of disease IEEE Spectrumposted a video about a stethoscope development at Johns Hopkins University last month. suggesting all talk of the stethoscope’s demise can be put aside. The news is not about demise but improvements. The Johns Hopkins team have invented their rendition of a “smart stethoscope”. Engineers, doctors and public health experts collaborated on the project. Rather than accept arguments elsewhere that the stethoscope was nearing extinction, they set out to reengineer it. 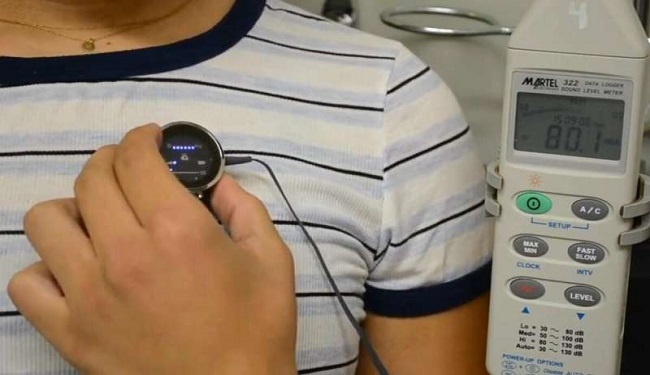 They said that “We wondered whether we could overcome the stethoscope’s limitations and thereby take advantage of its low cost and ease of use.” The Johns Hopkins design sought to ensure that a strong signal arrives at the user’s ears. First and foremost, the stethoscope tackles the noise factor, a limitation in traditional devices. Their device mitigates the noise. The Johns Hopkins smart stethoscope cancels out extraneous sounds and automatically identifies signs of pneumonia, with active acoustic filtering to isolate the breathing sounds. In classic stethoscopes, they wrote, environmental noise contaminates the signal at three points: at the chest piece, through the rubber hose, and at the ear of the user. Their rendition swaps the rubber hose for an electric cable. Their electronic stethoscope is a standout among other digital devices. Pneumonia diagnosis could benefit. “Worldwide, more kids die of pneumonia and other lung ailments than from any other cause,” they wrote. “These acute lower respiratory infections kill nearly 1 million children each year worldwide, causing more deaths than HIV and malaria combined.” Observed symptoms are shortness of breath, cough, and rapid breathing. Funding for their work was from the National Heart, Lung, and Blood Institute, NASA, and the Bill and Melinda Gates Foundation. IEEE Spectrum posted a video last month. In this demo, the researchers simulated an extremely noisy environment in the lab (the sound meter shows levels of around 70 decibels). They then compared the audio heard through a top-notch commercial stethoscope, in which the breathing sounds are mixed with ambient noise, to that heard through the Johns Hopkins smart stethoscope.